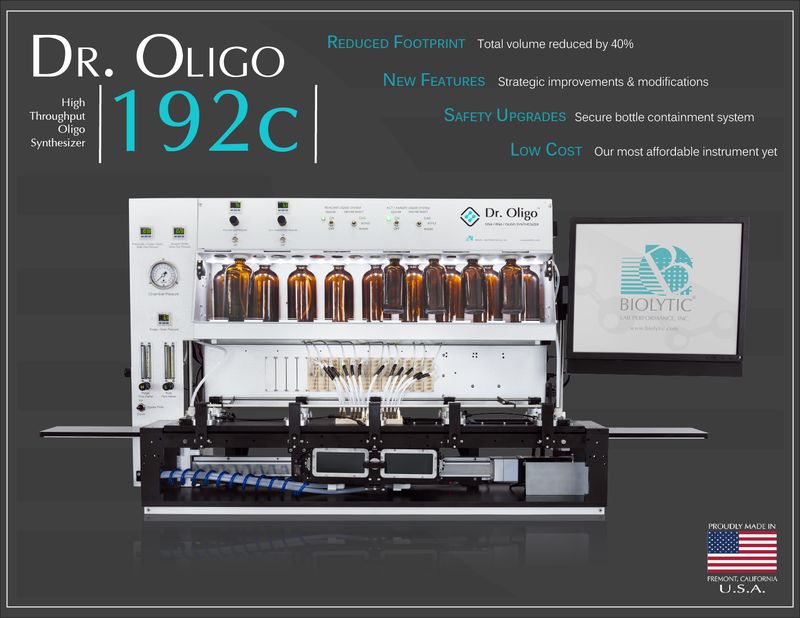 Biolytic Lab Performance, Inc. is proud to introduce the Dr. Oligo 192c – our latest high throughput oligo synthesizer. Now restructured with all the same principles that helped us become the industry's gold standard, the 192c is a faster, more compact model that can adapt to fit the various needs of our customers. This instrument came to life through innovative ideas of quality improvement, upgraded features and cost-efficiency - all of which have allowed us to provide Biolytic’s proven reliability at a much more affordable price. The Dr. Oligo 192c is truly an advancement in high throughput oligo synthesis. Customers all over the world use nucleic acids produced by our Dr. Oligo synthesizers for their own unique purposes. From applications like oligonucleotide and gene synthesis, genetic test kits, PCR/RT-PCR, siRNA/RNAi, miRNA, CRISPR Cas9, and DNA/RNA sequencing - to broader areas like evolutionary history, forensics, immunotherapy, diagnostic and therapeutic research – to high-throughput screening, natural product biosynthesis, reverse transcription PCP, hybridization, and SNPS – the variety is tremendous. Recently some have even endeavored into using nucleic acids as computer information storage devices, storing animated videos in DNA. The Dr. Oligo line has evolved alongside these cutting-edge discoveries, and with the 192c it will continue to play a significant role in modern science. "All the benefits of the original, and much more, at a lower cost." The Dr. Oligo 192c has been reduced in volume by more than 40% from the original 192. * While still maintaining the highest quality and reliability, the 192c will take up just a fraction of the space in your lab. Our Dr. Oligo 192c base model is compatible with up to 10 reagents - 4 standard and up to 6 additional reagents of any combination of the following: specials, second oxidation, double deblock or double wash. 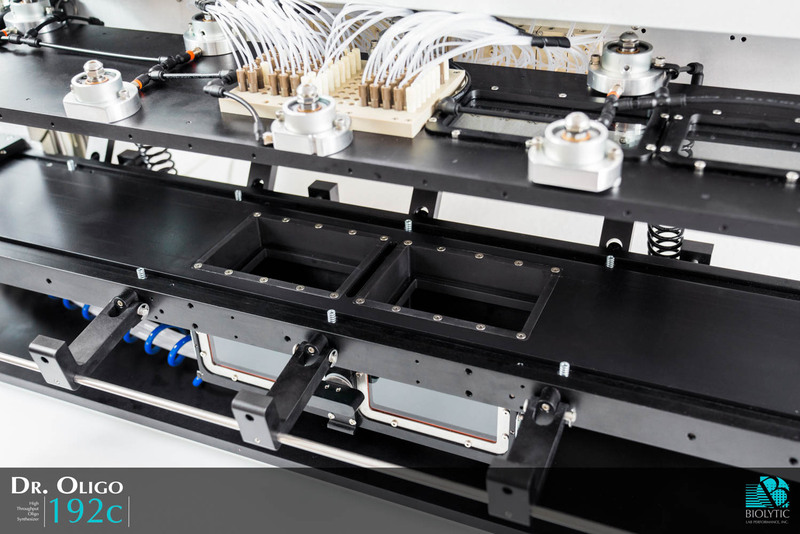 The open-frame structure of this instrument provides many opportunities for customization, supporting increased reagent counts and throughput. 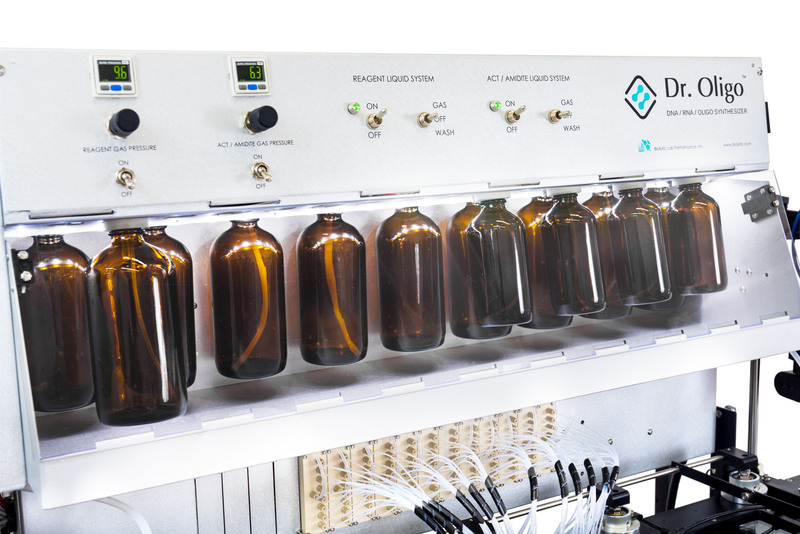 A new bottle containment system protects the instrument and its users against spills and breakage. Now located behind a transparent door, your bottles are safely isolated. 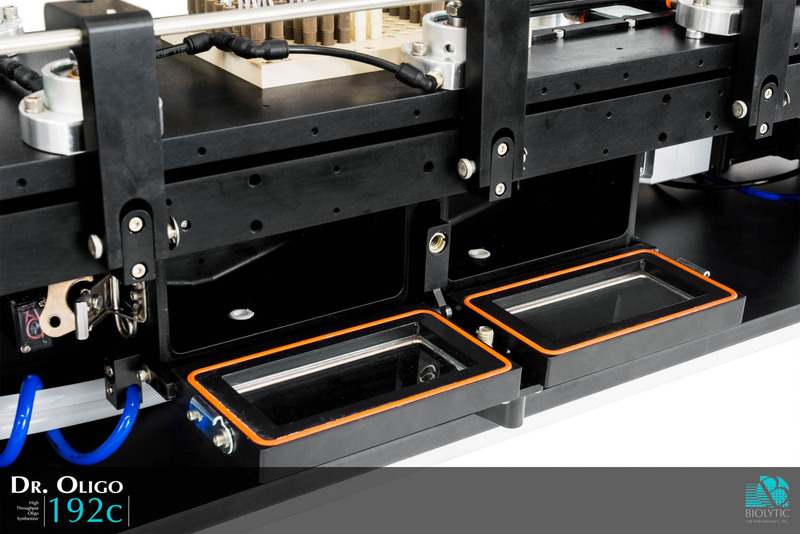 In the event of breakage, our innovative sealed catch tray drains directly to waste to ensure the safety of the operator. Maintenance is made simpler. 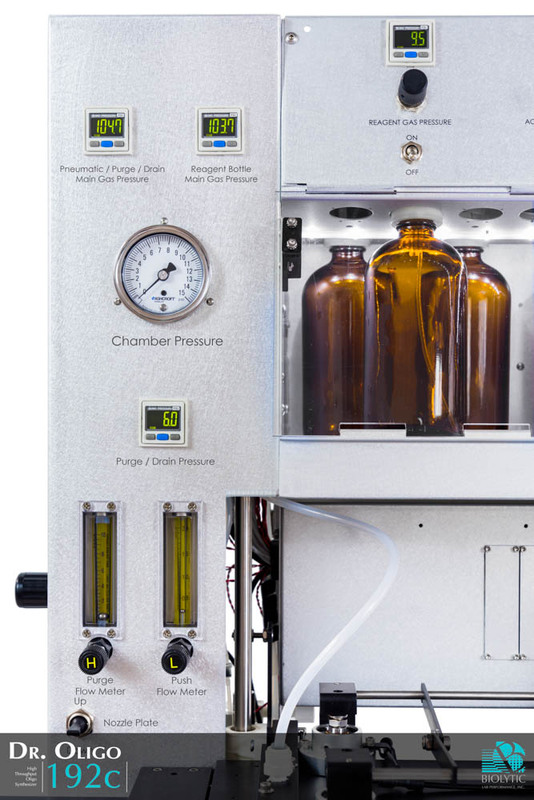 Purge, drain and pneumatic plumbing is physically separate from the bottle system, enabling easy and individual access. This industry-leading design creates unparalleled efficiency and serviceability. As with all of our instruments, Biolytic Certified Instrument Training (CIT) is available for the Dr. Oligo 192c. Upon successful completion of the certificate program, recipients will be able to understand the function of the instrument, how to operate it, and how to perform basic troubleshooting. This training, coupled with the 192c’s simple maintenance, will decrease total operation costs for the 192c. Please contact our sales department for more information and restrictions on this optional program. 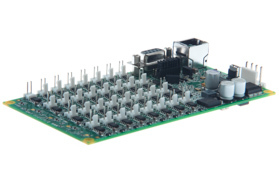 The debut of the Dr. Oligo 192c is also the introduction of new Driverless Biolytic Control Boards. Our control boards consist of 32 outputs and 8 inputs, designed by Biolytic specifically for the Dr. Oligo synthesizer line. They ensure proper dispensing of as little as 2ul** and are complete with an antistatic & shockproof design, on-board timing, valve short & valve flood protection, and real-time monitoring of valve electrical integrity. Antistatic – Ensures Boards are not affected by static electricity that can build up and disrupt delivery. 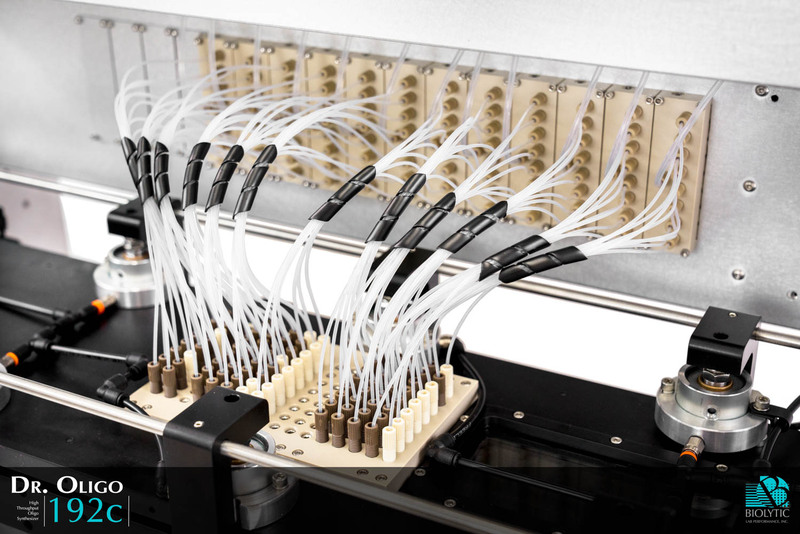 Shockproof – Controls movement of the instrument, making sure the delivery of reagents is not affected during synthesis. On-board timing - Guarantees reliability by executing the exact timing required by delivery. Valve short protection - If a valve shorts electrically, the board shuts down that driver and protects itself, thus eliminating the need to replace a board. Valve flood protection - This ensures that valves will shut down and synthesis will pause if communications between the PC and boards is lost. 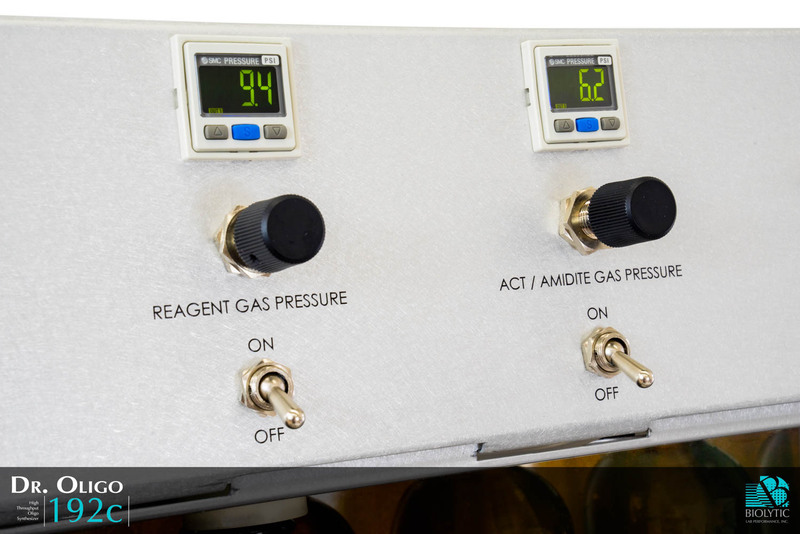 Real-time valve monitoring - Just prior to and during synthesis, the control boards monitor electrical integrity of all instrument valves. If any valve is in poor condition, the run will immediately pause and allow an operator to resolve the issue. The 192c software has faster loading times, updated user interface, advanced security, and a new Hardware Monitoring System. Security and Encryption – The software offers encrypted communication, which increases system uptime and improves the overall quality of each synthesis. Hardware Monitoring System – This new feature keeps operators updated on the status of instrument hardware, including the Biolytic Boards and motor. The system works in conjunction with our control boards to prompt users to take action in the event of hardware failure. 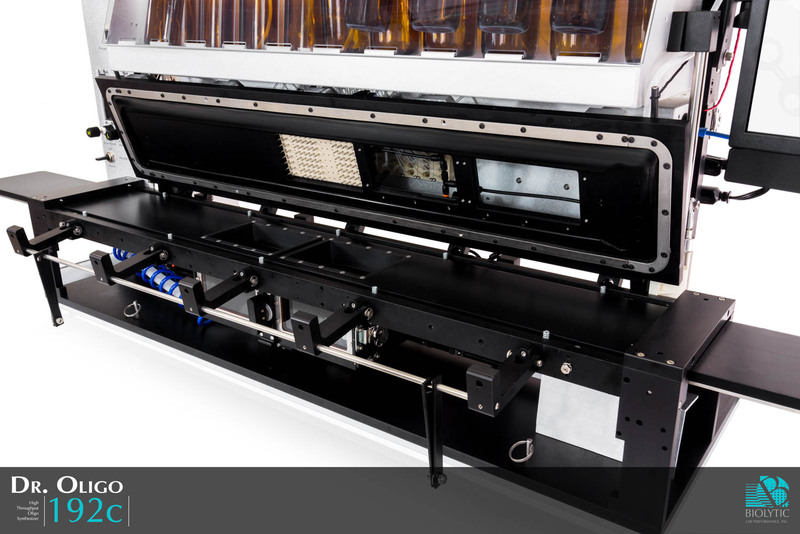 Side-by-side Slider Plate Windows: The Dr. Oligo 192c nozzle plate windows are now located side-by-side, a reconfiguration that allows users to oversee both reaction plates at the same time. 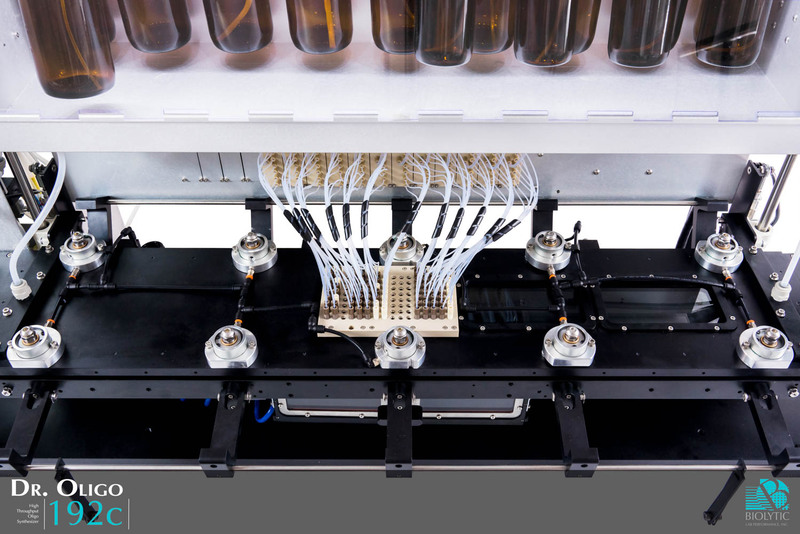 LED Bottle Backlighting: We have also added chemically safe LED backlighting to the bottle compartment, which makes monitoring reagent levels more convenient and ensures that the instrument is always prepared for synthesis. Our original 192 model came with a manual washing system and an additional automated wash option. 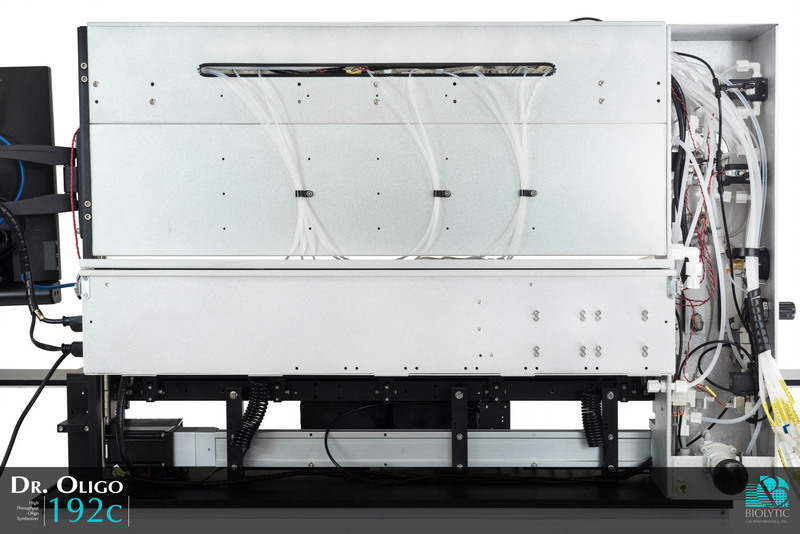 The 192c redefines that standard by including automatic nozzle washing with every instrument. 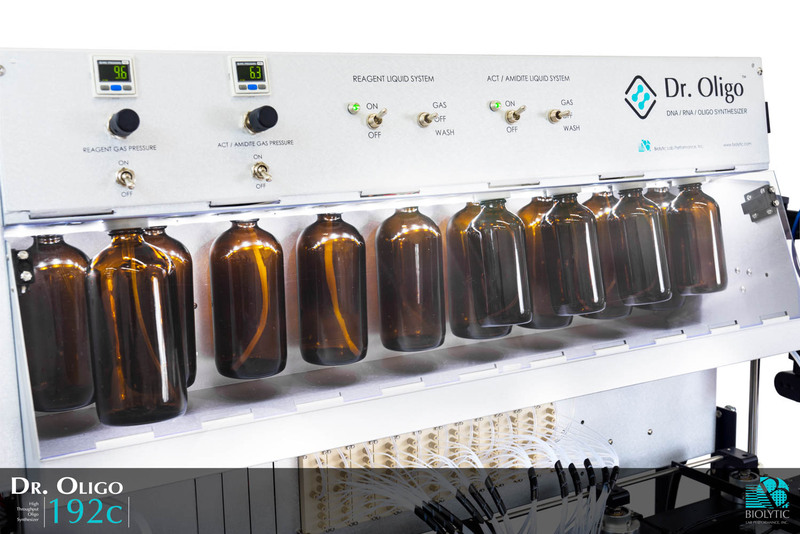 The reagent delivery system is now made with smaller valves and fills with less volume, thus cutting down unnecessary costs by reducing waste and allowing for faster, more consistent response times. Backed by Biolytic Lab Performance, Inc.’s 25 years of experience in reliable and efficient oligo synthesizers, these instruments are strategically constructed to optimize high quality and cost-efficiency, making the Dr. Oligo 192c exceptional and affordable. 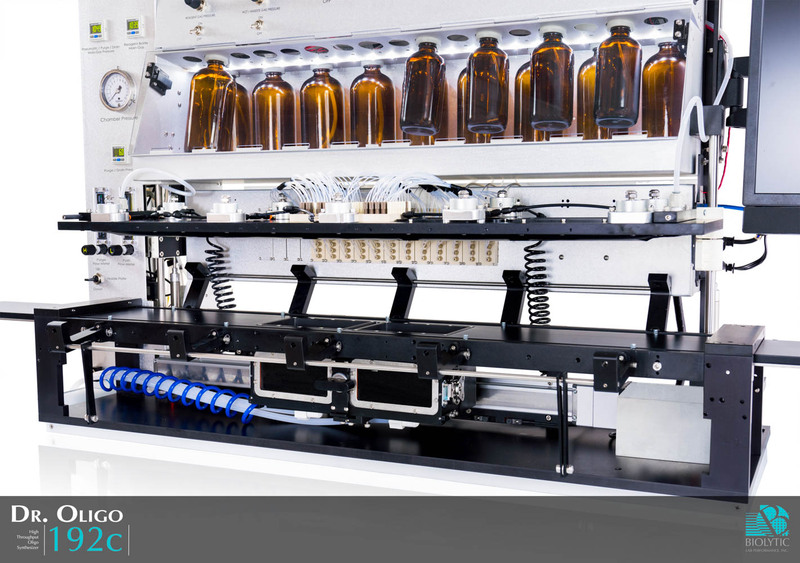 ** Actual minimal controlled dispense volume consists of the Biolytic Board V1 and appropriate reagent delivery system.